Cotton Bay Village is a Hotel and Villa Resort. If you believe that living space equates to luxury, then you will not be disappointed. Luxurious suites surrounding a giant Lagoon pool or smart Villas with private pools, all with access to Hotel services - it’s your choice. Cotton Bay Village is the only resort in Saint Lucia which offers villas with direct beach access and it’s also the only resort on the golf course! Amongst the amenities is “Heaven”, a 10,000 square ft spa with light and colour therapy steam room, the only Moroccan rasul in the Caribbean, and a couples suite for sharing hedonistic pleasures together. One of the most celebrated fine dining restaurants on the island combines with The Beach Club to offer guests flexible meal plans, including the opportunity to have a private chef for an evening. Hummingbird, a children’s club with crèche is one of the resorts acknowledged strengths that the kids love. Cotton Bay caps all that off with personal butler service and multi-lingual employees. These Hotel Suites and Private Villas are designed for free spirited travellers, who simply wish to do as they please and are only a stones throw away from the nightlife and restaurants in Rodney Bay. Cotton Bay is one of the most sought after places for those who yearn for some well earned peace and quiet. A closer to nature experience and a beach you can call your own are some very good reasons to make our village your home sometime this year, because individuality is our speciality. 74 luxury suites and Villas, with a combination of 1, 2, 3 and 4 bedrooms. 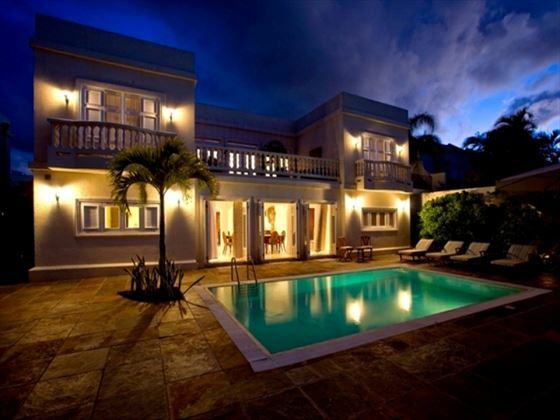 In addition it has 34 stand alone Villas with Private pool from 1-4 bedrooms. Larger units are also available with pool cottage, perfect for teenage guests or a nanny. 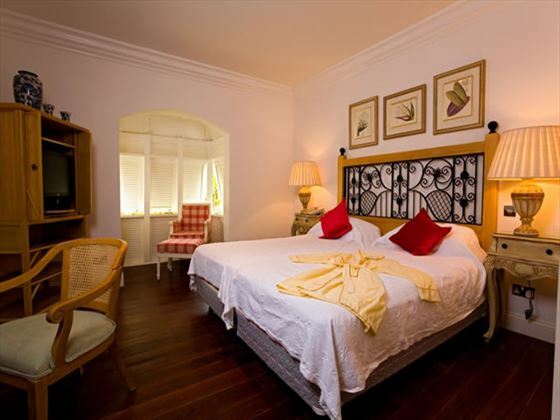 All of the bedrooms are en-suite and are furnished with either King or Queen size beds. 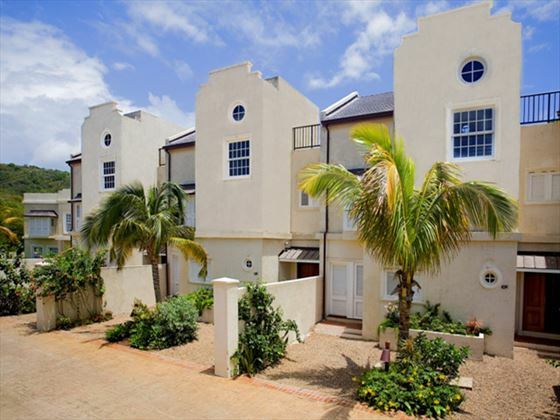 Furnished in an eclectic style, Cotton Bay offers the utmost in luxury and elegance. Each unit is self-contained with a designer kitchen, living room, dining room, a state of the art entertainment system and telecommunications facilities. (CDs & DVDs can be rented from the concierge). 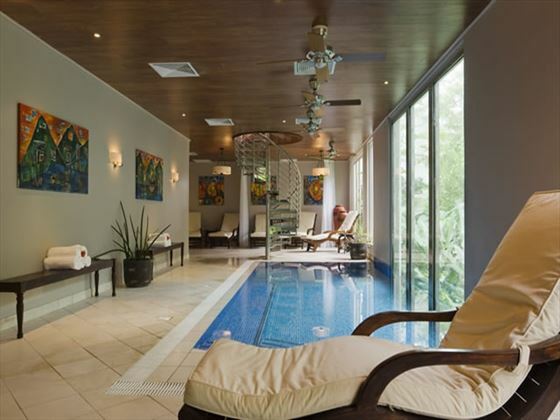 Villas have their own private pool and spa. Luxury Suites have direct access to a 35-metre lap pool and separate children’s pool. Coral Penthouse Suites come with rooftop sundeck and spa, while some Châteaux Mangoes are located on the beachfront. Châteaux Mango and Cotton House Villas come staffed with a private butler to attend to every whim while residents lie back in abject luxury! There are 26 ’All suites’, which are beautifully finished with hardwood floors and traditional timber louvered windows. Bedrooms are air-conditioned with en-suite. All Master bedrooms in the apartments have four-poster beds. 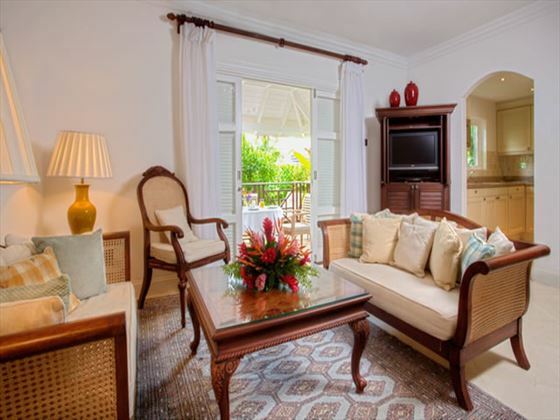 Sitting rooms have TV, CD and DVD players and an eclectic blend of furnishings from painted French furniture, modern metal designs and Colonial Plantation styles, including traditional mahogany. 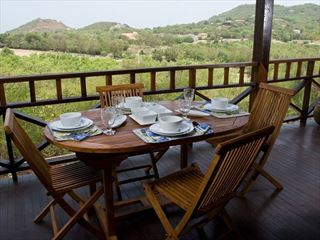 All ground floor suites have covered dining terraces featuring teak dining furniture and a private sun terrace. All first floor suites are complete with a sun terrace and dining balcony. One, Two and three bedroom apartment suites are available. All the suites overlook the free-form swimming pool, to which there is direct access. Tamarind suite - One and two bedroom luxury apartment suites which cover over 1300 sq ft Calabash suite - Spacious 1700 sq ft 2 bedroom apartment suites overlooking the freeform swimming pool. Coral Penthouse Suite - with over 3000 sq ft of luxury, these 3 bedroom penthouse suites boast a roof top sundeck with personal Spa. Terracotta Villa with an open lounge, Al Fresco dining terrace, kitchen and breakfast bar, covered dining terrace, three bedrooms (all with en-suite bathrooms, walk in dressing rooms and balconies) a garden and private swimming pool and a top deck with a private sun terrace and Jacuzzi. Cotton Bay’s Terracotta Villas are both elegant and stylish. Some villas have the addition of a guest cottage with a delightful sitting room and en-suite bedroom. This accommodation is perfect for extra guests, teenage children who want some privacy or for families needing extra space for a nanny. 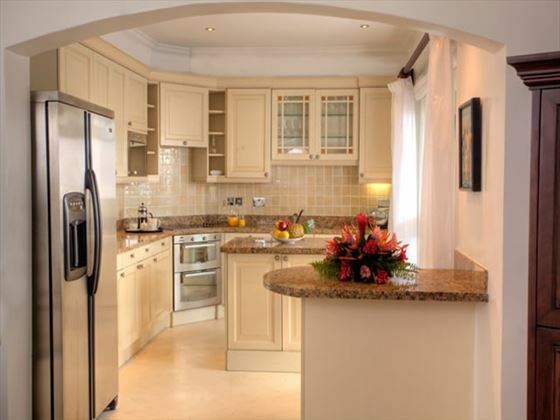 Châteaux Mango Villas are the most luxurious three bedroom villas. Ideal for a family, group of friends or even a business gathering. These villas are the envy of Cotton Bay Village. Beautiful exterior coral renderings and an entrance fountain immediately welcome you to this lavish dwelling. 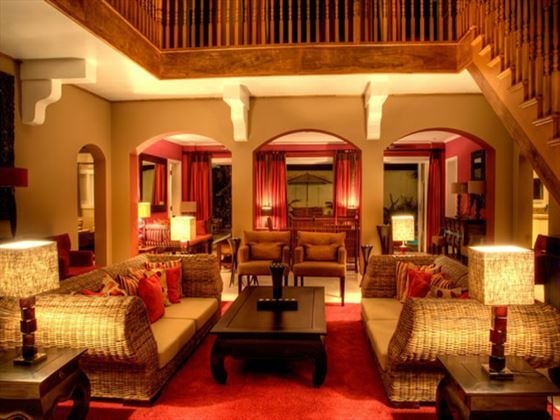 An entrance lobby opens up to a grand sitting area and a teak dining room with glazed vaulted ceilings. 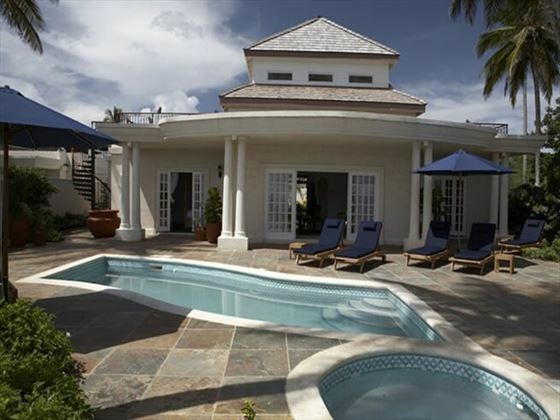 An open terrace, garden with dining gazebo and private pool makes for the perfect outdoors. Because Châteaux Mangoes are on one level, with high ceilings, there is a wonderful feeling of freedom and space. These villas are perfect for BBQ evenings around the pool, especially since it comes with your own personal Butler to look after you and your guests. 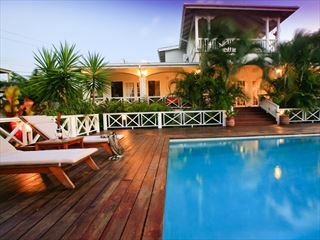 Châteaux Mango (Beachfront): Same as above located on the beach. For the ultimate in colonial style Caribbean living, the Cotton Houses are the largest properties at Cotton Bay Village and can sleep up to 10 people. Some Cotton Houses feature the additional guest cottage and are perfect for grandparents, teenagers, extra guests, a nanny or a-live in butler should you wish. The Cotton Houses are two storey affairs with double vaulted ceilings set off with a stunning chandelier. You ascend to the first floor via a mahogany staircase to a gallery from which three gorgeous en-suite bedrooms are located. The master bedroom has a huge dressing room and bathroom and a large sun terrace. The terrace is designed to open up from the gallery, which is wonderful for hosting guests or holding a house party. A drawing room sits below the gallery and a stylish covered dining terrace leads to an exterior sundeck, a garden with dinning gazebo and swimming pool. The ground floor also boasts a family TV room, ensuite guest bedroom, kitchen, laundry and pantry. The kitchen is beautifully appointed featuring a central preparation table in marble. As with the Châteaux Mangoes, Cotton Houses come fully staffed with your personal Butler. The Butler’s duties include: the supervision of the villa housekeeping, preparation of daily breakfast, assisting family with shopping in our Deli or Convenience shop and with the preparation of light meals. The Butler can also assist with valet services and laundry. Butlers have the responsibility for all private functions and are available to live in at additional charge. The Humming Bird Children’s club is available daily and offers varied activities (see below) for children ages 3 – 7. Toddlers can be accommodated, accompanied by a nanny. A daily programme of land and water activities is provided for older children and there is a creche for 3months to 3 years old. All residences have their own full sized kitchen so self catering is a popular option at the village with a Deli and convenience store on site. There are also 2 great restaurants - Beach casual at 1461, open daily for a la carte breakfast lunch and dinner and host to a weekly beach BBQ. Piano Piano offers elegant fine dining in a fully air conditioned environment and is the perfect spot for pre and post dinner cocktail in the champagne piano bar. 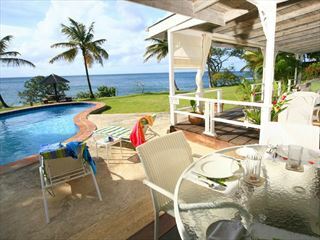 This beautifully designed three bedroom villa in St Lucia is a lovely retreat for a family, friends or couples. The jalousie shutters running along the front of the villa open out from the Caribbean-colonial style living area onto a lovely wooden veranda.